The story of the now world-famous 'cleaning spray' bottle moves on to the next chapter, with the captivating irony of the design continuing to cause a stir. 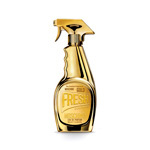 Moschino pink fresh couture is the new, fresh floral fragrance for her. A brand new object of desire by Moschino that interprets the original essence in a delightful and refreshing way. A new colour code that hints at trends for spring/summer.